The compact, elegantly styled VPL-FHZ75 laser projector showcases cutting-edge Sony picture innovations and installation-friendly features - making it ideal for high brightness projection applications in midsize corporate, education and public environments. The projector's long-lasting laser light source and newly-developed 0.76-inch 3LCD panel with incorporated optical compensator are augmented by powerful Reality Creation and colour processing technologies by Sony. This ensures exceptionally high-contrast images with WUXGA resolution, true-to-life colour and very high 6,500 lumens brightness - ideal for delivering lectures and presentations with extra audience engagement. Leveraging its long-term experience in laser projector development and analysis, Sony's Intelligent Setting function simplifies installation, offering four pre-sets that adjust brightness, cooling system, colour and other projector settings for optimal performance in meeting/classrooms, museums, entertainment venues and multi-screen setups. With its compact 'blend-in' design and widest vertical lens shift range in its class, the VPL-FHZ75 is ideal for installation even in limited spaces, while extra flexility's provided with accurately-proportioned projection onto angled surfaces. The laser is complemented by a newly-developed 0.76-inch LCD panel with incorporated optical compensator. Combined with powerful signal processing technology, this ensures vivid images with crisp detail, ∞:1 contrast and natural, accurate colour reproduction. Picture quality is boosted by Sony's unique super resolution Reality Creation technology which uses a powerful pattern-matching database to optimise lower-resolution images, enhancing image clarity without increasing digital picture noise. Leveraging its long-term experience in laser projector development and analysis, Sony's Intelligent Settings offer four presets, optimising brightness, cooling system and other projector settings to suit all usage environments - simplifying installation for busy system integrators. 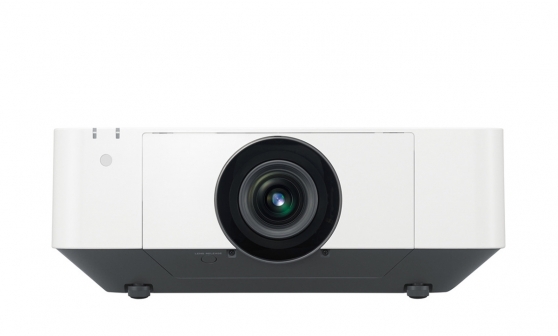 The industry’s widest lens shift* capability of Vertical +70% gives greater flexibility for positioning the projector, and ensures that presenters or visitors aren’t distracted by the projector's light source. *In the range of 5000-6500 lm. As of 5th February 2019, according to Sony research. Installation flexibility is increased by a wide range of compatible lens options to suit virtually any size of room and throw requirements. New quick-release bayonet mount simplifies lens exchange. Constant Bright maintains the same brightness throughout the 20,000 hours recommended lifespan. The slim, stylish body design features a flat top surface that blends in discreetly when the projector is ceiling mounted. The clean appearance is accentuated by a new terminal cover that reduces cable clutter. The advanced laser light source offers up to 20,000 hours* operation without lamp exchange, reducing lifetime running costs compared with traditional projectors. *Actual hours may vary depending on usage environment. After extended periods, colour can be automatically calibrated to the original factory condition. There’s no need for extra calibration equipment or cameras; a built-in colour sensor stores all the necessary information. *Extron and XTP Systems are trademarks of RGB Systems Inc.